← Where have all the sales people gone? It is time for a new logo even though this site has never really had a logo. Nothing says “I have changed” like a new logo. I don’t have a staff so I can not reorganize and there isn’t anyone I can fire or I would because that would be a sign of change and change is good. 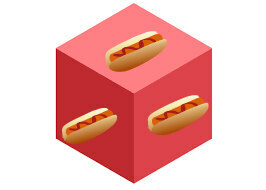 The logo represents hot dogs on a cube. It is a bit dated (it was created yesterday) but can always be updated by going back to not having a logo. The reason I have not written much lately is that I have been busy updating the logo. Now I’ll have to work on rolling it out which is going to be hard because it is a cube, not a ball.